I've been eating a lot of chorizo lately, namely Yorkshire Chorizo, and cracking stuff it is too. You can currently get a hold of two varieties, original and picante, the former being high quality fatty cuts of pork and seasonings including loads of smoked paprika that is cured and air dried, the picante is the same but with added cayenne for heat and spice. The picante is my pick of the two for cooking with as the added seasoning seems to help maintain a strong chorizo flavour once cooked - the original is the better of the two uncooked though, sliced and eaten alongside a beer. (Both can be eaten uncooked safely though). 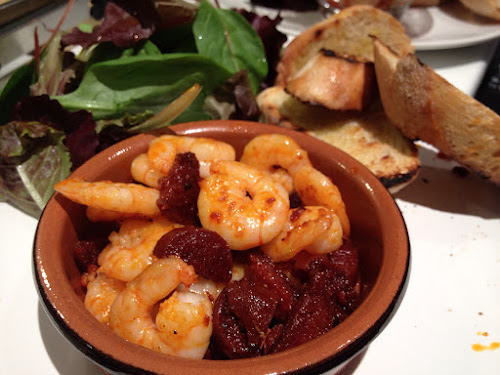 One of the easiest and most satisfying ways to use chorizo is with prawns in this classic tapas style dish. Simply pour a glug of olive oil into a large non stick pan and add as much sliced or chopped chorizo as you fancy. Cook on a low heat to allow the red tinted fat time to render out, then crank up the heat and throw in some raw peeled prawns and a good twist of black pepper and a little salt. Stir fry for a minute or so until the prawns are cooked and coated in chorizoey goodness. While the prawns are cooking drizzle some sliced bread (I like sourdough but ciabatta or even French stick will work fine) with a little olive oil then griddle until lightly charred. To serve tip the lot into little tapas dishes (or any small bowls) so that the oil reserves at the bottom for dipping and serve with piles of bread and a big green salad. Beer-wise, something sweet but hoppy is the way to go. An American red ale or something like Magic Rock Rapture or BrewDog 5am Saint would work great great. I don't know why I still haven't tried it yet! I met Chris at the Morrisons pop up restaurant last year and he is a really nice guy!